One of the struggles I had while developing Long John revolved around how it would look. While trying to nail down the visual language, I initially went for a more realistically rendered style (well, as realistic as maybe I could get with my baseline style), but as I kept drawing that way, I was plagued by a question that floated above me during the entirety of Long John‘s development: Who wants to read a western comic? As I mentioned on the Serious Talk. Seriously podcast, I decided to tell a heightened reality western (meaning that if everybody went just a little more crazy then this could actually happen), set it in a real place, and draw the characters larger than life. I kind of wanted Long John to look like we imagine tall tales to be. When I hit on that idea, my first thought was of video games (which shouldn’t surprise any of my old friends). 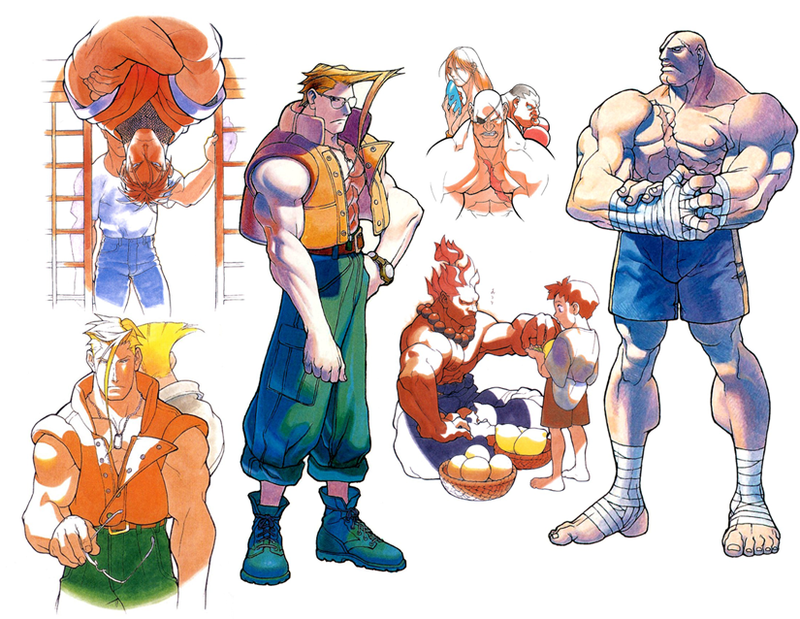 Some Street Fighter Alpha concept art by Bengus. Specifically, I thought of the Japanese game developer, Capcom, back when they were in their early-90s heyday making classic arcade fighting games like Super Street Fighter II, Darkstalkers, X-Men: Children of the Atom, and so on through the Marvel vs. Capcom and Street Fighter Alpha days. 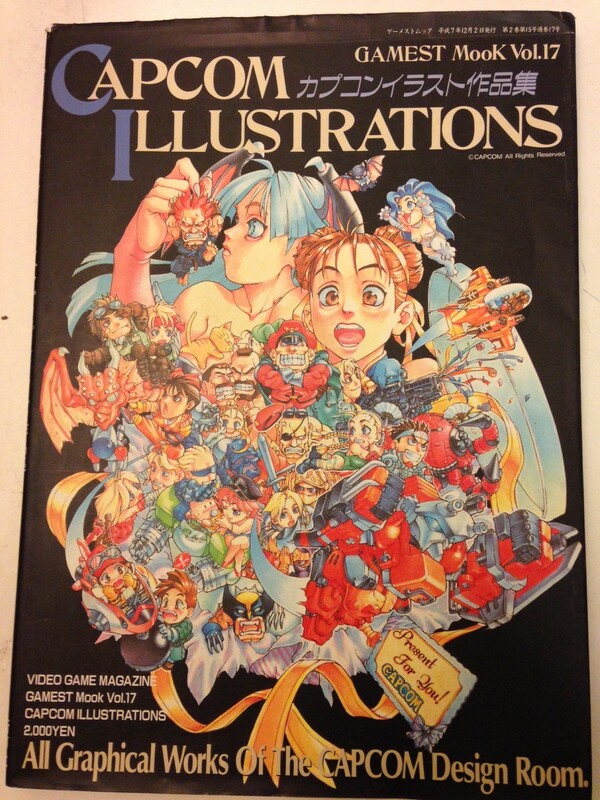 I found the concept art not only through playing the games, but in a book Capcom released in the mid-’90s that I bought in San Francisco’s Japantown. The book is almost completely in Japanese, but I learned so much from that book that its influence is inseparable from any education I received in my native language. 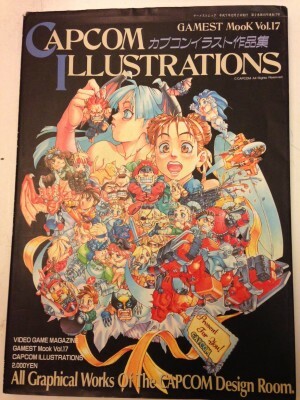 The Capcom art book purchased in San Francisco in the mid-’90s. In a sense, they looked like exaggerated versions of American superhero comics in the 1990s, but they also looked much more grounded and thought out than most ’90s superhero artists could muster. 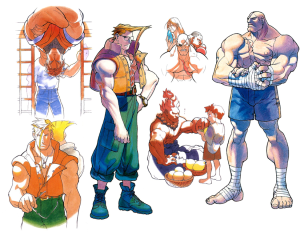 Capcom characters had presence and character, the artists were real storytellers who could capture an entire personality and even anecdotal scenario with a single drawing. Capcom characters––though they were created for the sole reason to kick the tar out of each other and their stories were vestigial at best––felt very believable. Boss Fleming, of all the characters so far, really captures the “Capcom” feel, for what it’s worth. He’s big and exaggerated and his look suggests so many stories and character traits (in my eyes). 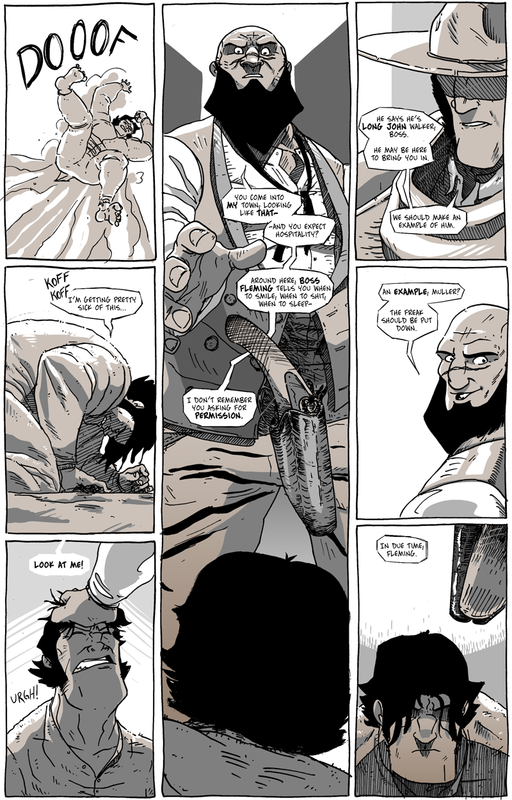 Furthermore, the tall middle panel in this page and the fourth panel of the previous page really capture the character as I imagined him to be and I feel those two drawings really convey much more than we read or will ever see from him. It’s these little victories that help bolster the morale. Just to let you know, I will be appearing next Thursday (11 September 2014) at the local artist/nerd convention, Art Mix | Crocker-Con, as an exhibitor. This is the second time the show has been around and it was a resounding success last year. It is at the Crocker Art Museum in downtown Sacramento and lasts from 5pm until 9pm. Admission is $10 or free if you cosplay or are members of the museum. It is a show designed with adults in mind (including $5 drink specials), but it should be a lot of fun. There will be live music, an expanded showfloor, and a lot of local artists. I don’t have much in the way of merchandise, but I will be selling what I’m calling a “Preview Edition” of the first ten pages of the book. It doesn’t have anything that isn’t already on the site, but if you come by to buy one, I’ll sign it and probably be giving away Long John and/or Eben07 sketches with each copy. But, the book is mostly for those who haven’t been to the site and can get into it. 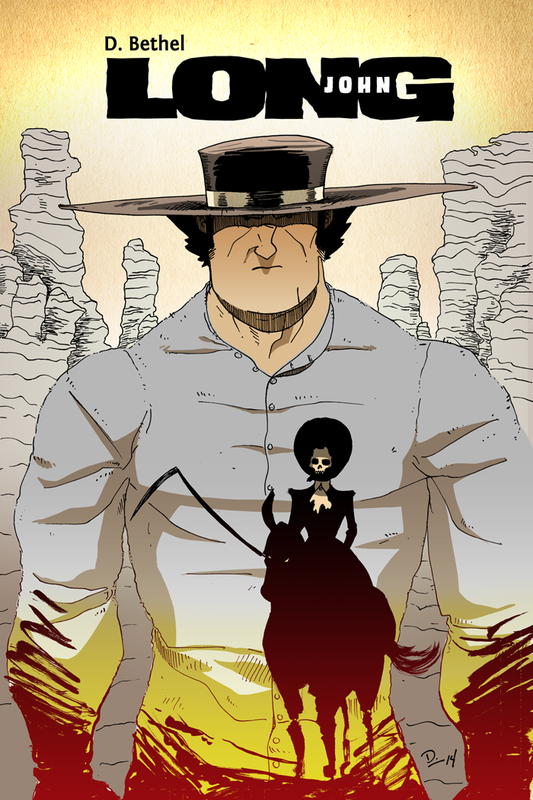 The cover for the Crocker-Con Preview Edition book. I’m also making a bookmark that I’ll be using basically as a business card. It’s a little risque, but it’s fun and true to the comic. Also, if you’re on Facebook and haven’t joined the Official Long John Facebook Page, then do so! I’ll be posting sketches and art (such as the two included above) there as well as posting links to blog posts, regular updates, and links to cool (and possibly) relevant things I find on the internet. You can also post stuff you find or talk about Long John or whatever. The Facebook page allows an easy flow of communication between me and you, the readers. So, “Like” it today! A Facebook Page for For All Intents and Purposes, my nerdy/geeky discussion podcast that I do with my nerd co-dependent, Andrew Asplund, has been created. Like it, too, for regular updates, fan art, links to interesting and relevant things, and general nerdy discussion. (You’ll have to do a search in Facebook for it, using “For All Intents and Purposes” should be enough to bring it up.) Also, be sure to subscribe to the podcast on iTunes––leave a review on iTunes as well so iTunes can spread the word! That’s very kind of you to say! I’m glad you enjoy the comic! The scheming second-in-command in Poverty Flat, Muller seems to be both the angel and the devil on Boss Fleming's shoulder.